Very unique and original hand made spoon featuring a handle made out of a bullet shell and the bowl is made from a large Australian penny which is dated 1943, so this is a World War ll piece. Obviously the bullet shell is not silver nor is the coin. These spoons are marked "stg silver". 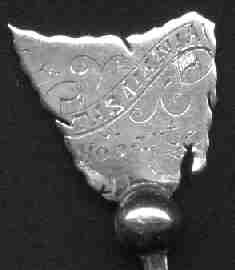 That appears to be an Australian style marking for "sterling silver". IMHO the combination of the round ball inside a diamond is a very interesting juxtaposition of geometric figures and is the reason I acquired this spoon. 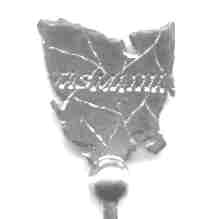 The finial showing the outline of Tasmania is engraved. The back is marked W. Golding. This is not a matched set, I acquired these pieces at different times over a period of years. This tiny salt spoon has a hand made and engraved handle that looks like a cactus . The bowl is a three pence Edward Vll coin dated 1910. 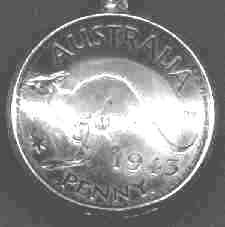 The picture in the coin shows a kangaroo and an emu on the sides of a shield which is labeled "Advance Australia". 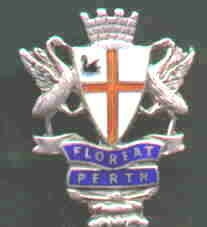 The coat of arms consists of a shield composed of 6 parts, each containing one of the state badges. These are surrounded by an ermine border, signifying the federation of the states into the Commonwealth. 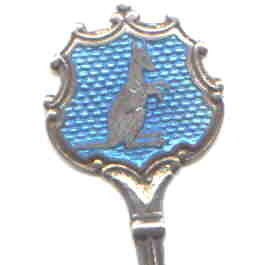 The shield is supported by 2 Australian animals, the kangaroo and the emu, standing on ornamental rests, behind which are small branches of wattle. The crest consists of the seven-pointed Commonwealth gold star, a symbol of national unity. 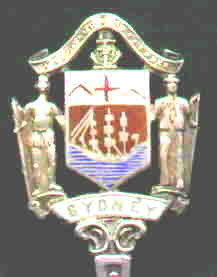 At the base of the shield is a scroll on which is printed the word 'Australia'. The kangaroo and emu were chosen for this shield because they are the only animals that cannot backup (thus the shield cannot tip over). 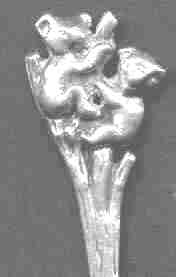 This very strange spoon appears to be hand hammered from aluminum and has an acid etched picture of a platypus on the handle. The spoon measures about 8.75" (220mm) and the bowl diameter is about 4" (100mm). The back has an engraved mark which looks like intertwined "FD" (maybe) and is also engraved with the words "Australia and Platypus"
Some artists of the Arts and Crafts period often chose to work with materials other than gold and silver. When aluminum first became available in the 1850's it was more expensive than silver or gold. In the first part of this century an inexpensive smelting process was developed and the metal became economically priced. 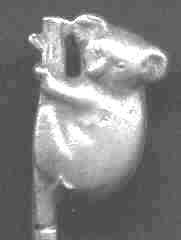 A number of artists used this "new metal" to make decorative objects. 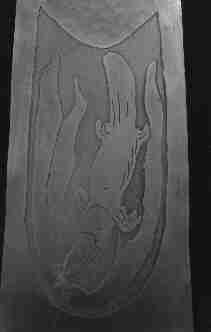 Some collectors specialize in hand hammered aluminum pieces from the late 1920's - late 1940's. 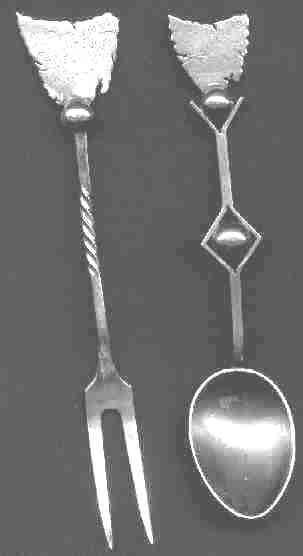 This is the first "souvenir spoon" which I have seen in this style.